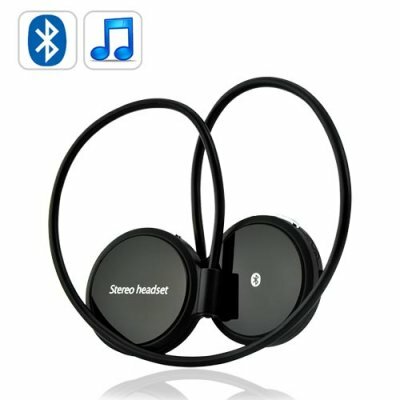 Successfully Added Flexible Bluetooth Stereo Headset - Slim Edition to your Shopping Cart. Enjoy the freedom of wireless headphones with this Flexible Stereo Bluetooth Headset. The new Slim Edition is lighter and more comfortable than ever while still offering amazing sound quality and handy on-ear music controls. Most Bluetooth headsets products today are primarily built for phone functions with little thought for using Bluetooth’s ability to stream music via A2DP. Well, here is a great personal/business Bluetooth product that is both a comfortable wireless phone headset and also a great wireless music stereo earphone set. This product features a flexible wire-to-over-ear design that is perfect for any head shape and has easy-fit ear buds for ultimate comfort while wearing throughout the day. It also comes with a built-in microphone, volume control, call answer/reject, and music next/previous button controls, giving you even more versatility in its use. A simple pairing with your Bluetooth mobile phone, MP3/MP4 player, or laptop/notebook computer is all that's needed to enjoy awesome tunes and easy phone calls wherever you are. The Flexible Bluetooth Stereo Headset is perfect for people who use computer programs such as Skype and MSN Messenger, or enjoy using their mobile phones to listen to music while out and about. This is another great product for today's modern lifestyle that is sure to be a popular product. Click "Add to Cart" now and let us express ship you a sample to see for yourself the great performance this Bluetooth headset provides. Then list them on your webshop or eBay store front and start making some serious money. How can I use this Bluetooth headset, when my laptop computer does not have a Bluetooth enabled device? Were can I purchase a USB Bluetooth dongle? Here is a list that is currently available of our website, please feel free to check out product codes: CVSB-014, CVSB-K04, TX-Dongle-09, any of these three USB dongles will enable you to pair this Flexible Bluetooth headset with you computer or Notebook. How do you charge this Bluetooth stereo headset? Just connect the Bluetooth headset to your computer with the supplied USB cable. Good headset. It is easy to sit on head, just in management, high quality, beautiful sound. For the price - just a fairy tale. on 2011-02-22 23:30:26 LOVE IT! Hi, i´m from Austria! Just got this Bluetooth Headset and i love it! I don´t expected it would have so good quality! The sound is amazing!